This is a post about Kingdom Theology. But it’s not. Today the now and the not yet slam against each other with violent force, leaving aftershocks that shake me throughout each day. Just when I find that moment of peace, I feel a rumble. It’s like the whole earth is groaning. Today I sat in the front row of a beautiful old church, holding my youngest in my lap, her head resting in the crook of my neck, listening to kids sing about God’s love and following after Him. Faces beaming they epitomized joy. This temporarily removed the thoughts about another plane that went missing this morning and the fact that my husband will fly across the ocean this fall and that planes seem to be dropping out of the sky with regularity. 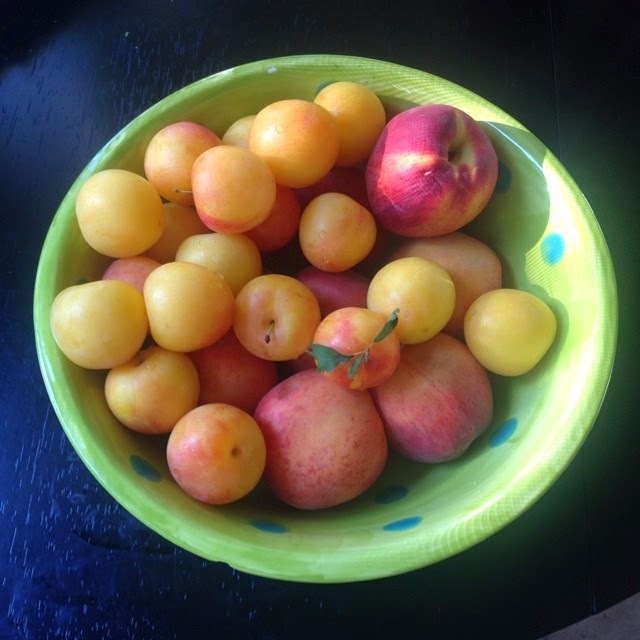 Yesterday we went to our neighborhood farmers’ market and found some beautiful peaches and golden plums to take home. My oldest added up the cost of the produce and proudly made the transaction. We then held hands as we walked down the street and found our way to our favorite Indian restaurant. 13 miles away, on the other end of our city, a family is still mourning after their daughter was killed in their home. She was microwaving marshmallows with her friends to make s’mores at their slumber party. In too many areas of Chicago it isn't safe to go outside, so they stayed in their apartment, yet a bullet found its way through a cracked open window and a wall before lodging itself in the little girl, killing her. The sun is shining, the wind is blowing, and summer feels perfect. I watch my kids play in the park with their friends. Their shrieks of laughter blend with the sound of the birds singing. Their feet pounding on the pavement as they run mark a rhythm and everything feels like music. Half a world away, 121 Palestinian children have died in thepast two weeks, with another 1,100 injured. My city of Chicago has seen 218homicides this year; 34 have been children under the age of 18. I don’t know how to hold it all in anymore. I can’t even list the wars, the children fleeing danger, the hate, the murders, the drive-by shooting/hit a mile from my house, and the racism that I see seeping through everything. I vacillate between mourning and anger. I have meditated on Psalm 103 the past two days. What are my hands doing? Today my hands type this lament, in hopes that somehow it helps push the darkness back. In hopes that it is part of making a way for the not yet. Today my hands tear sack cloth and pour ash on my head because I need to mourn. And today my hands will rock my babies, brush their hair, hold their hands, and wipe away their tears. Today my hands will turn palms up to the heavens and wait. Because they need to do something. They need to help push back the darkness. Kyrie eleison, Lord have mercy.